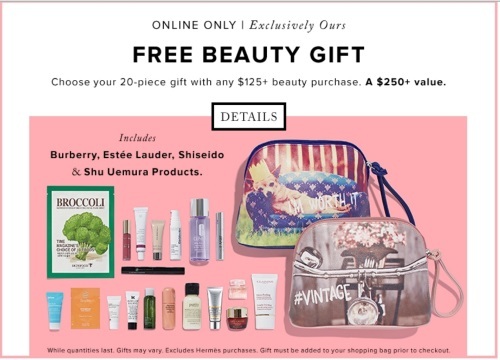 Hudson's Bay has a Free Beauty Gift promotion on now! Get a 20 piece gift with any $125 beauty purchase (a $250+ value). The beauty gift includes products from Burberry, Estee Lauder, Shiseido and Shu Uemura products. This is an online exclusive, while quantities last. Gift must be added to your shopping bag prior to checkout.